Carbonara is said to be one of the four quintessential Roman pasta dishes, it sums up the beauty of Roman cooking- simple, confident and exceedingly good! Getting this dish right is an art, and one worth perfecting- more eggs yolks (brighter orange the better) then you think, not being shy on the parmesan and plenty of black pepper, whilst making sure you don’t end up with egg-fried pasta! This is overcome by the crucial moment, the moment you pull the pan from the heat and add the egg and cheese to the pancetta mix with your al dente spaghetti with a little reserved cooking water, and stirring through to create your creamy sauce. With this classic base, you can tweak here and there, maybe making it meat-free, adding seasonal greens (like we have), fresh and herby, naughty and cheesy or some depth with a little picante. 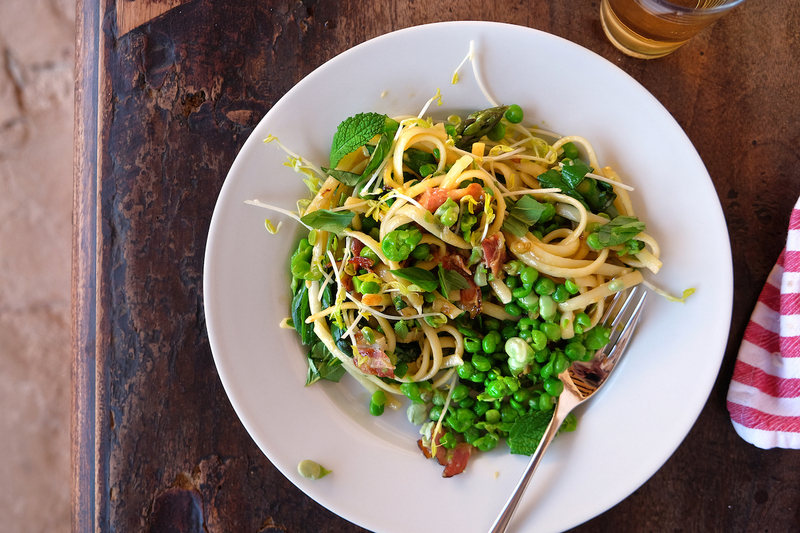 This is our springtime tweak- making it a lighter and brighter version, but still keeping that luxurious, indulgent tastes of a carbonara. This is a perfect dinner for all ages, a great family number, good way of getting greens in for your little ones Pasta is something we both share-a full on foodie addiction! It’s almost like an obsessive relationship- needing it for comfort, thinking of it daily/ trying not to think of it daily, giving into it and indulging in it with great gusto most nights of the week- and yes we like it every which way. We find ourselves taking long weekend jaunts to Italy throughout the years with our ‘fellas’ (Tom and Ben), it seems to be a little tradition for these romantic trips away. We come back with new found muffin tops, relating the dreamiest of pasta memories to one another- clear days in Positano up above the cliff tops feasting upon vongole, to a hard to find family run joints in Rome eating seppia al nero. So we would like to keep churning out pasta recipes for our column, for all the like-minded pasta enthusiasts out there! 1. Boil water in a big pot and add your spaghetti with a little salt. Cook to your instructions, keeping a little al dente (save a glass of water for later) 2. Slice the asparagus on the diagonal, around 1 cm pieces. Steam with the peas and broad beans if using) for no longer then 2-3 mins. Put into a bowl of cold water to stop them from over cooking. 3. Heat a little olive oil in a pan over a medium heat, add the pancetta, stirring, letting it go golden and then add your chopped shallots and garlic. Cook until beginning to caramelise. 4. In a bowl mix your 4 egg yolks, grated parmesan, chopped basil and mint with the lemon zest and a good squeeze of lemon. 5. Mix the cooked spaghetti with some of its hot cooking water (2 tbs) with the bacon and shallots, adding the spring greens and then (making sure not on the heat) stir in the egg mixture. Keep stirring to create your creamy sauce.